Romano is another variety of hard cheese, that originated from Italy. It is manufactured with cow’s milk or sheep’s milk or goat’s milk or mixture of these. 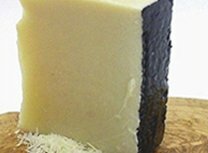 Romano cheese has a grainy texture.